I know some like the smooth texture of a cow’s milk yogurt, but desire a plant-based cow’s milk free alternative that will also be a good source of calcium and vitamin D. This Peachy Chia ‘Yogurt’ is made without any added refined sugars and uses fortified soy milk that is a good source of protein and also comes fortified in calcium, vitamin D and vitamin B-12. The recipe is also super easy to make as it only involves 4 ingredients and 5 easy steps. Don’t have peaches? Use ripe nectarines instead for the same delicious result! With chia seeds contributing nutritionally and as a gelling agent, this naturally sweetened plant-based, egg-free, dairy-free, oil-free, gluten-free and nut-free high protein ‘yogurt’ packs an extra nutritional punch. Each serving (1 cup) provides 5 grams of protein, 4 grams of fiber, approximately 23 percent Daily Value of vitamin A, 27 percent Daily Value of vitamin C, 7 percent Daily Value of iron and close to 20 percent Daily Value of calcium! This is comparable to many store bought cow’s milk dairy yogurts which generally provide between 15 – 25 percent Daily Value of calcium per serving. Although using a fortified original flavored soy milk will give these ‘yogurts’ the most calorie and protein content, you can use other alternative original flavored fortified plant-based milks if you or a family member has a soy allergy. Enjoy this ‘yogurt’ on its own, throw some dry breakfast cereal on top or even spread this as a sauce over waffles and pancakes. Although this ‘yogurt’ doesn’t freeze well, it does keep in the fridge for up to 2 days so it can be made in advance the night or day before. A simple summery naturally sweet homemade nutrient-dense ‘yogurt’ that’s vegan, refined sugar-free, egg-free, dairy-free, oil-free and gluten-free. Makes a delicious breakfast, snack or dessert option! Place 1 1/4 cups [300 mL] of fortified original flavored soy milk (or other fortified plant-based milk alternative) into a small saucepan on a low heat setting. Add the chia seeds then stir to combine and let the pot contents warm up. When you add the diced fruit into the saucepan, turn up the heat to a medium heat setting and stir to mix until all is well combined. Let cook for 5 minutes, stirring occasionally. The pot contents should be heated up until nearly simmering (but not bubbling or boiling). Mix 1 teaspoon of cornstarch (or corn flour) into the remaining ¼ cup [60 mL] of cold soy milk, until well mixed. Then add this into the saucepan and stir to combine. Let the entire saucepan mixture come to a very gentle simmer for 4-5 minutes (barely bubbling), then turn off the heat immediately. This mixture will continue to thicken as it cools, forming a thicker creamy texture. Transfer this ‘yogurt’ into a large mason jar or portion into individual glasses. Store in the refrigerator for at least 30 – 60 minutes to chill and develop a creamier texture. Then take out and devour! 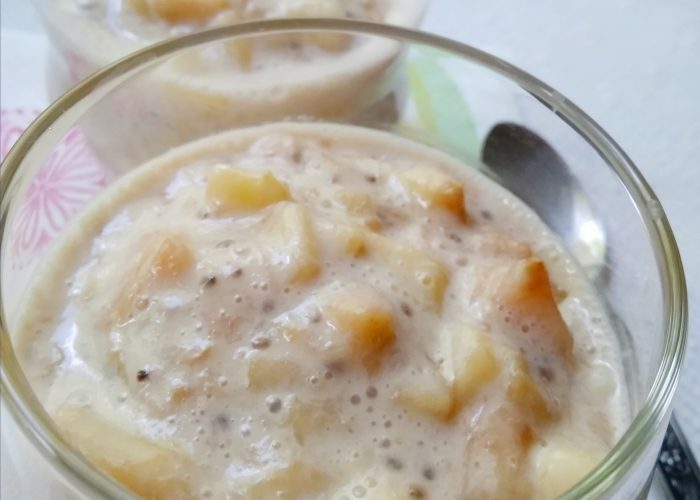 This Peachy Chia ‘Yogurt’ is best consumed on the same day, but can be kept up to 2 days in the refrigerator. Note that after sitting in the refrigerator for a day or so, the diced fruit in the ‘yogurt’ may start to turn a bit darker. If you have a soy allergy or if you have a preference for a different plant-based milk, you can use another alternative fortified plant-based milk in this recipe. However, if you do so, know that the calorie and protein content of the final product will not be as high as if a fortified soy milk beverage is used. Although there are good non-dairy options for yogurt commercially available, I find that this is a simple yet delicious way to make a nutrient-dense calcium rich plant-based version of my own at home. This naturally sweet fresh fruit ‘yogurt’ will leave you and your family craving for more, and its texture is especially suited for older infants (already established on solids) and young toddlers to enjoy. It is also a good option for children who don’t find the taste of fortified plant-based milks appealing on their own so need alternative good plant-based calcium and vitamin D rich options. When I first introduced a small amount of this ‘yogurt’ to my 2 year old toddler, she spent so much time scraping clean the bowl after she had finished the ‘yogurt’, that even my meat-loving stepfather noticed. The next time I brought out this glass jar of homemade ‘yogurt’ to the table thinking to share its contents with my toddler, she threw a tantrum because she wanted me to give her the ENTIRE contents of the jar, and not just half! Wow ! This looks so refreshing & delicious ! !